1. At design time - In the solution explorer, expand "References" folder. 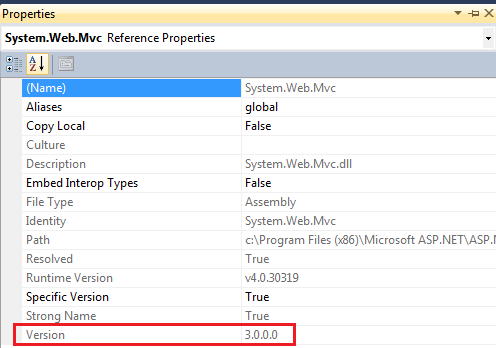 Right click on System.Web.Mvc assembly and select "Properties" and you can find the version that's used as shown below. No programmer can unlike your tutorials ...... And the way you teaches is Superb !!!!!!!! craete a project on ERP in VS using which u want i think best is c# and mssql. Hi can u plz create sample mvc app with oracle connection? Is it Possible that an asp.net form data can be transfer to mvc application? If it is possible then weather validations are performed at view page? If validation fails weather the information is get back to the asp.net form? How to add a textbox value to dynamic table ?